Today, 29th July, we visited Pickering’s hide for the high tide roost. We expected the water to be low in the scrape pool but were pleasantly surprised as the rain had added a significant amount of water to it. The high tides this weekend should remedy the situation by filling it up completely. Obviously the low water levels in the pool had concentrated the shrimps, any small fish and insect-life into a confined area. We ﻿immediately noticed a little egret on the pool, which was joined a short while later by two more. All three continued to feed while we were there. The great-white egret was roosting below the bank on the far side of Hale Marsh and we hoped it would join the little egrets when the tide rose but this was not to be. 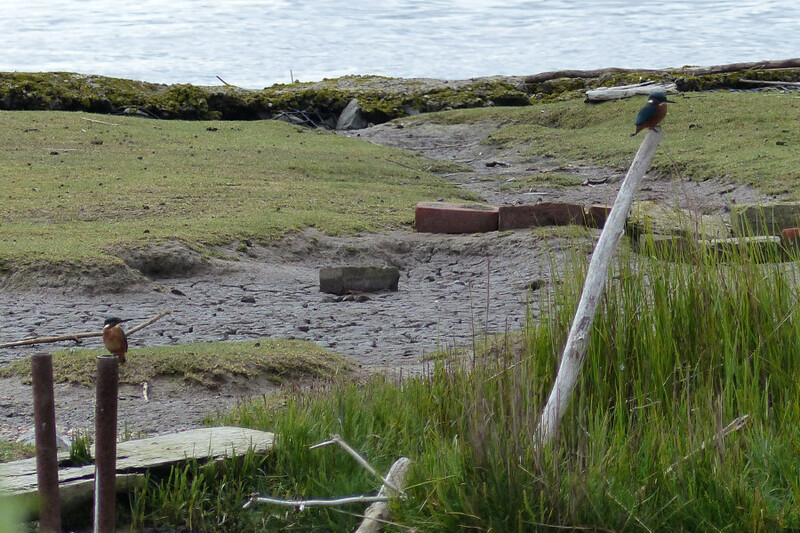 Meanwhile, moving further along the hide we noticed the kingfisher on the dam: sitting quietly. It eventually hovered over the pool and back to one of its posts on the dam, with a shrimp, before starting feeding more intensely. A good number of people were delighted to see it again, especially some children on their school holidays. It was while showing the bird to a girl that I noticed a kingfisher fly across the pool but then realised the other one was still there. Annoyingly the second kingfisher had disappeared and after half an hour doubt was beginning to set in. Eventually we found the two together on the dam. They continued to stay side-by-side in different parts of the pool until we left. The two kingfishers by the dam. Our interest was further increased by a stoat that made its way around the pond from the far side. It disappeared from time to time: only to reappear somewhere else. Eventually it vanished into the reeds. A redshank and several black-headed gulls were feeding on the pools and at least two common sandpipers fed alongside them. A flock of lapwings were roosting out the tide along the edge of the bank and several pied wagtails and a young yellow wagtail fed around the edges. Three sand martins on migration briefly flew across the pool.